BMW has launched a new variant of the 6-Series GT, known as the 620d, with prices starting at INR 63.90 lakh (ex-showroom, pan India). 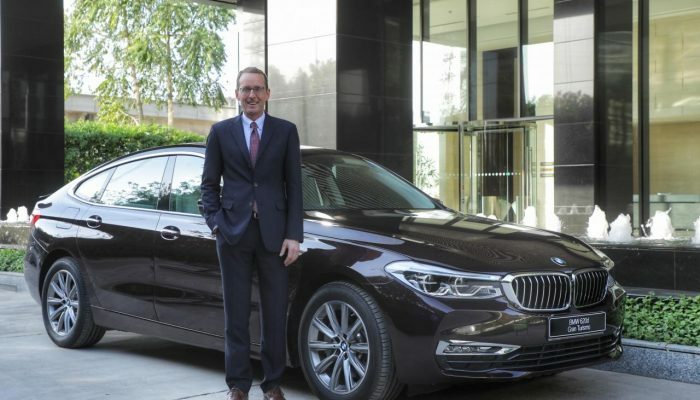 The 620d will now be the entry level variant in the 6-Series line-up and will sit below the 630i and the 630d in the company’s Indian product portfolio. At the heart of the BMW 6-Series 620d is a 2.0-litre, four-cylinder, turbocharged diesel engine that is capable of producing 190 hp of power at 4,000 rpm and 400 Nm of torque between 1,750-2,500 rpm. This engine is paired to an eight-speed automatic transmission that enables the model to sprint from 0-100 km/h in 7.9 seconds. Feature-wise, the new BMW 620d in the 6-Series comes equipped with Adaptive LED headlamps, cornering lights, 10.25 inch touchscreen infotainment system, with Apple CarPlay, 8.8 inch fully digital instrument console, ambient lighting, gesture control, panoramic sunroof, electrically adjustable rear seats with powered sun blinds, wood and chrome interior trims and rear seat entertainment package with two 10.2 inch colour screens, Blue-ray player, HDMI connections for MP3 players and gaming consoles. Safety features on the BMW 620d include ABS with Brake Assist, Dynamic Stability Control (DSC), Traction Control, Cornering Brake Control, Hill Descent Control and run-flat tyres. Also on offer are five drive modes including Sport, Comfort, Comfort+, Eco Pro and Adaptive.